2.The GR3660-TB3 is equipped with three configuration modes to suit every need. 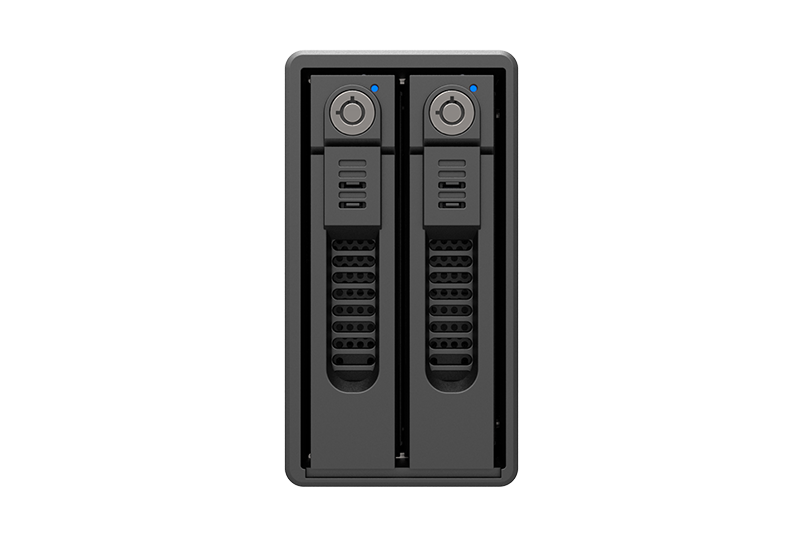 4.GR3660-TB3 to support 2 x 3.5" / 2.5" SATA HDD/SSD. 5.Thunderbolt™ 3 The USB-C that does it all. A software RAID storage system is unable to overcome the problems associated with cross-platform usage. 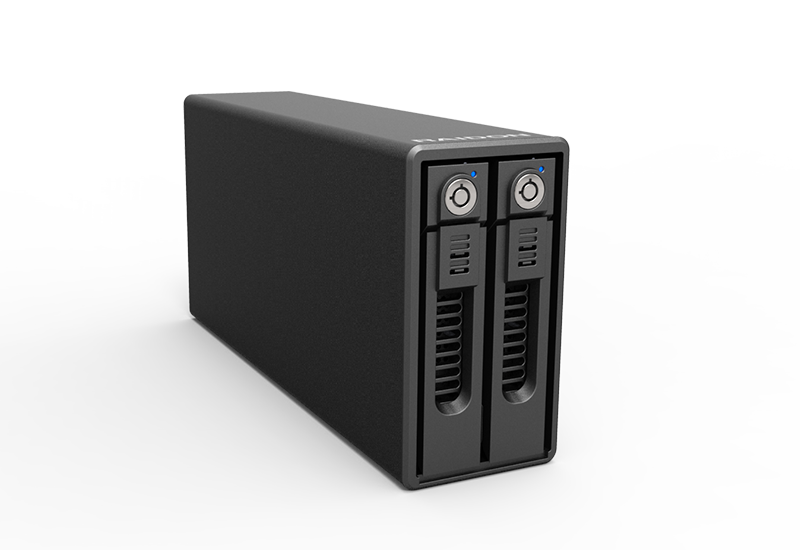 It is only through hardware RAID controller chipsets that users can use these hard drives concurrently in Mac or Windows computers. 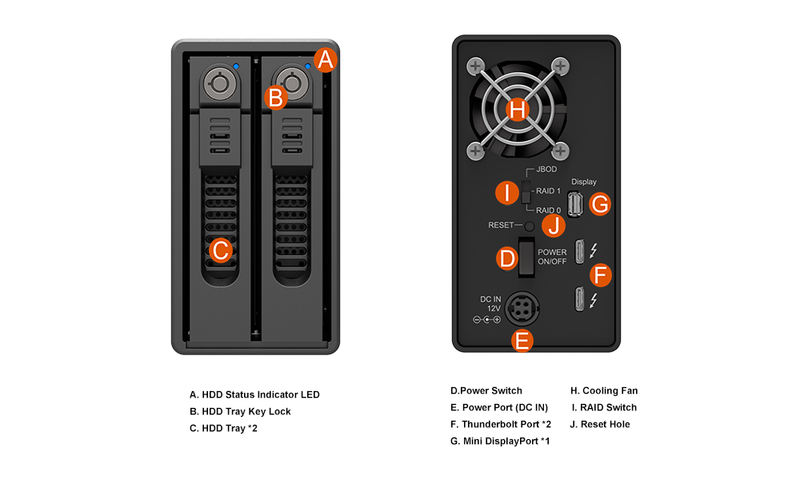 With the GR3660's built-in hardware RAID controller chipset and Thunderbolt™ 3 host interface, not only does it promise high transmission speed, it also eliminates the cross-platform usage issues associated with RAID 0 or RAID 1 setups. Also, with hardware RAID, all data is computed and processed by the built-in CPU. With such advantages, your computer performance can be focused on running the software and work, instead of handling the storage device's transmission issues. 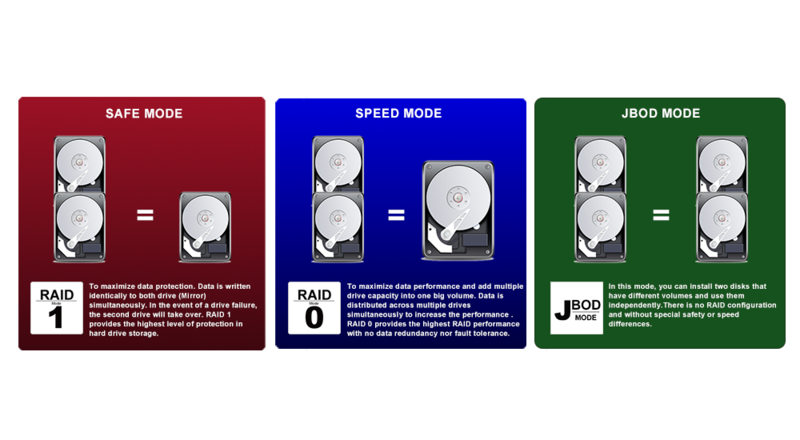 The GR3660-TB3 has three built-in disk configuration modes: RAID 1 (Safe Mode), RAID 0 (Speed Mode), JBOD (Two Independent Volumes) for you to choose according to your needs. 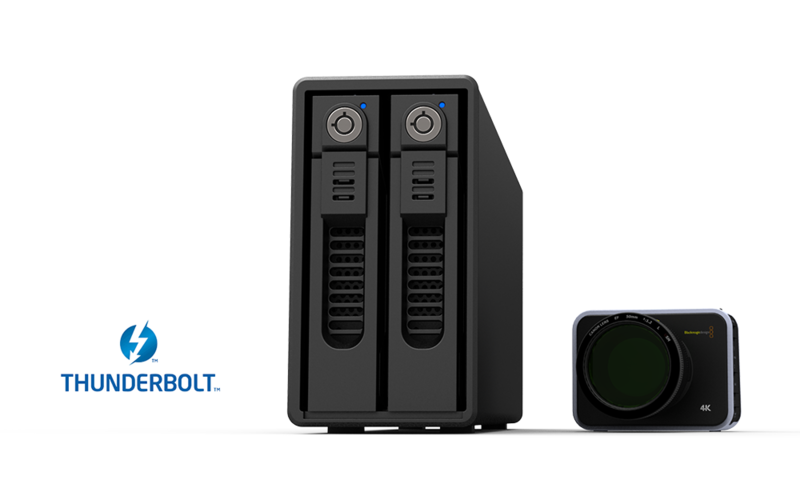 GR3660-TB3 supports Thunderbolt™ 3 interface for an extreme high data transfer speed. 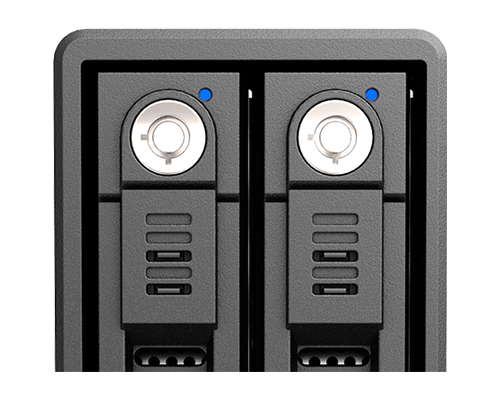 And both of the two Thunderbolt™ 3 ports are equipped with a up to 40Gb/s data transfer rate which is 4 times faster than USB 3.1 Gen 2 ,2 times faster than Thunderbolt™ 2 interface. You could definitely use it to play your 4K high-resolution films with no any lagging hassle. 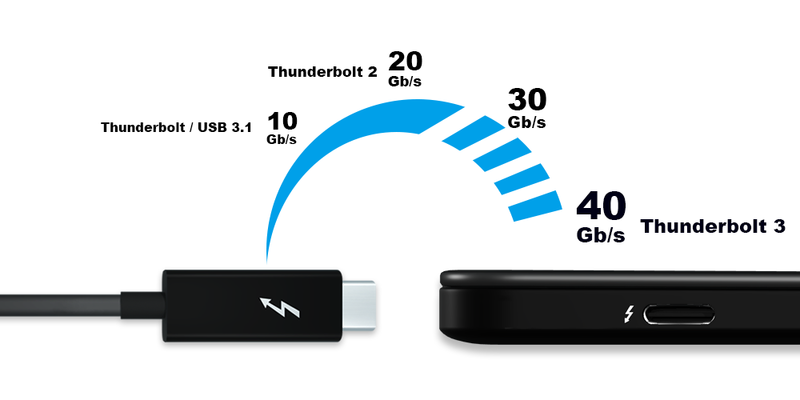 Thunderbolt™ 3.0 interface not only brings you this high data transfer rate advantage, it also let you chain maximum up to 6 GR3660-TB3 products (or other compatible storage products). 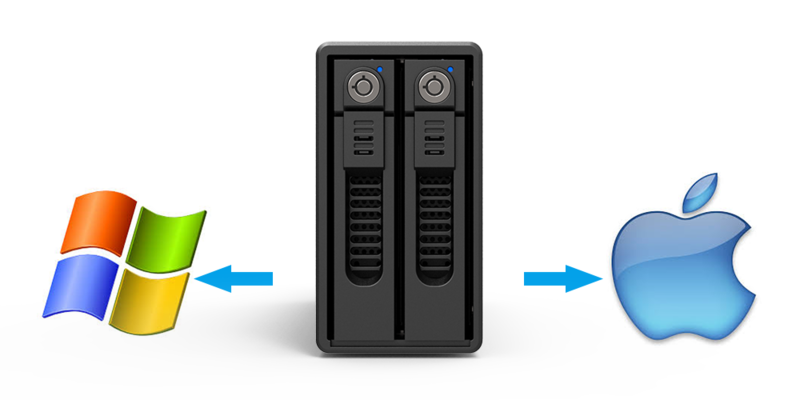 To bundle with two new easy-to-use Trays, GR3660 supports any kinds of 3.5" & 2.5" HDDs/SSDs. And also, GR3660's aluminum housing help protecting your data from its solid structure design and the excellent heat dissipation. GR3660-TB3's solid chassis is made by a thickness aluminum-alloy plate. And its aluminum housing and the 4 cm FANs (with safe FAN GUARDs) really help an efficient heat dissipation for your long time use. It seems simple, but the GR3660 LED status lights give users an instant status indication for each of the HDDs, it flashes when it is in use, however, many RAID devices on the market only featuring a power light unable to provide user the cause of factor once HDD failed. 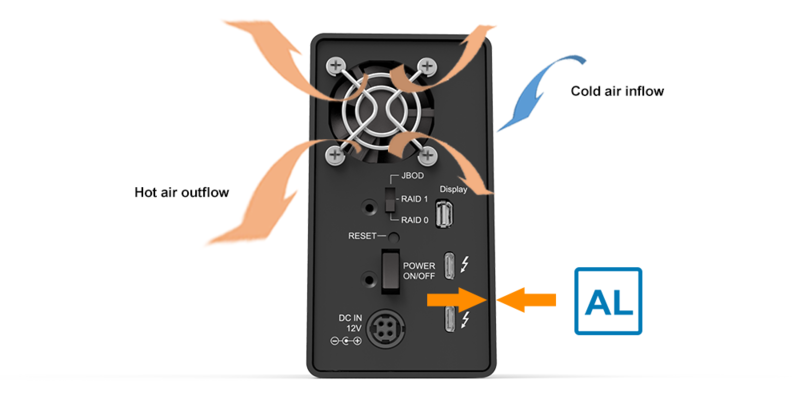 GR3660-TB3 uses energy-efficient hardware components that work hand in hand with the Mac system to conserve power. It spins down hard drives and activates sleep mode after a period of inactivity. 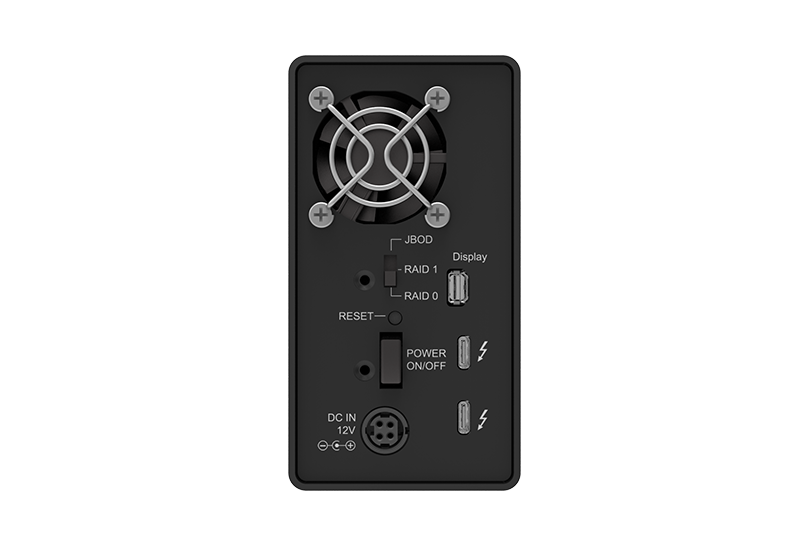 All our Thunderbolt™3 products support USB C type connector and you could always use it to charge not only your mobile phone but notebook thru its 15W 5V/3A PD (Power Delivery) feature. The GR3660-TB3 has a sleek exterior design that’ll never go out of style when placed next to your Mac. It’s also built tough with thickness aluminum to shield the enclosed drives durably and to dissipate the heat created by the drives faster for the drives to work comfortably. 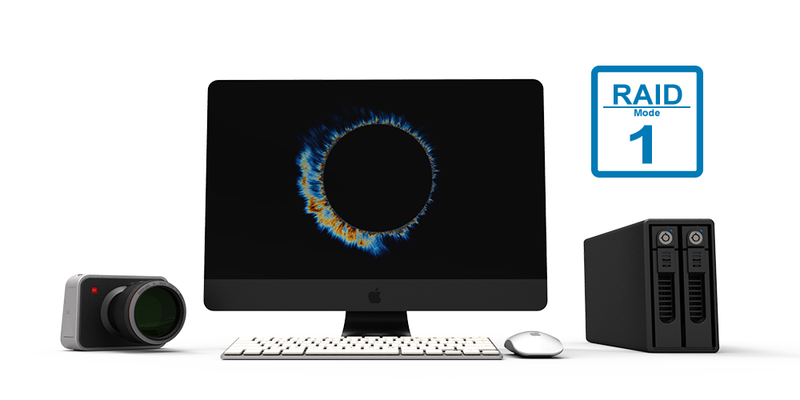 You can also easily extend your legacy device with Thunderbolt™ 3 (USB-C) interface, which connects to a iMac Pro device with Thunderbolt™ 3 (USB-C) interface. 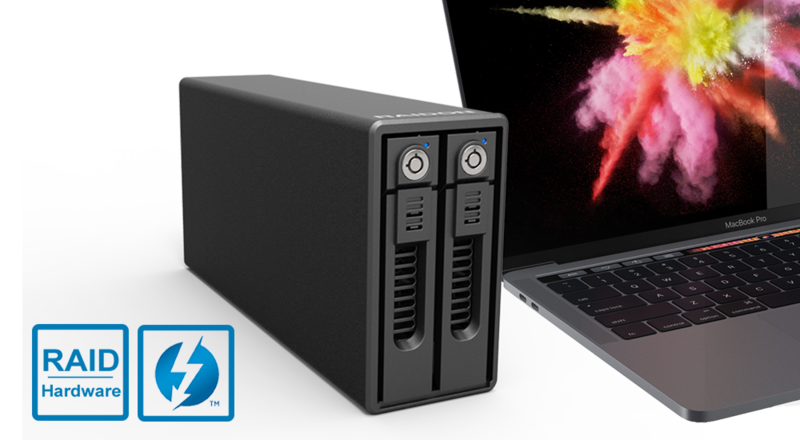 Your iMac Pro could connect to one GR3660-TB3 for a huge memory storage capacity thru its high performance Thunderbolt™ 3 interface. 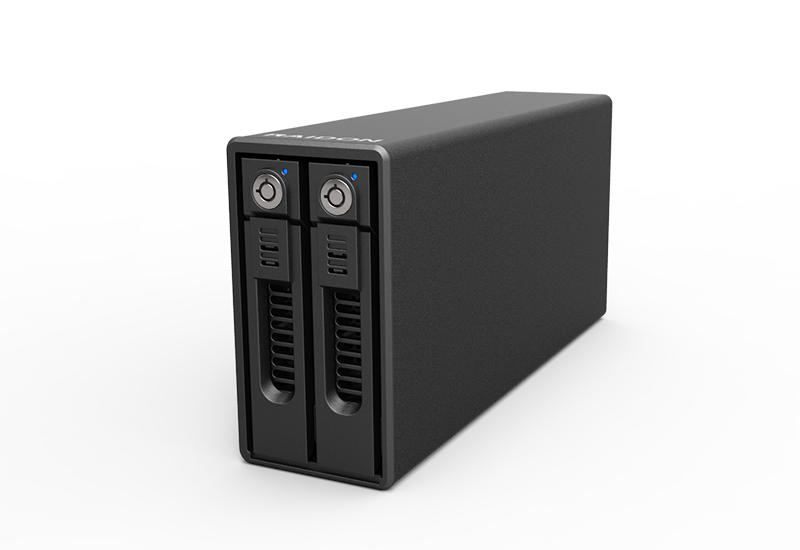 You could definitely enjoy its huge memory capacity together with the RAID 1 for an excellent data protection. 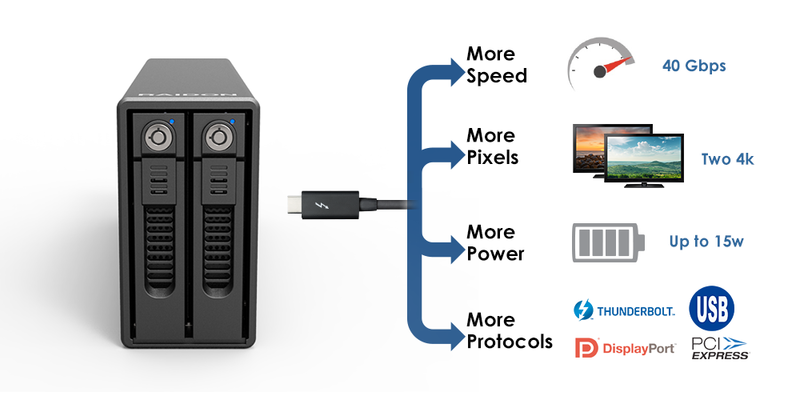 With two ultrafast Thunderbolt™ 3 ports, you can build a photo studio around Macbook Pro and GR3660-TB3. Or take them with you and import thousands of RAW images on location. Once your photos are on your computer, editing in Aperture is faster and more responsive than before. 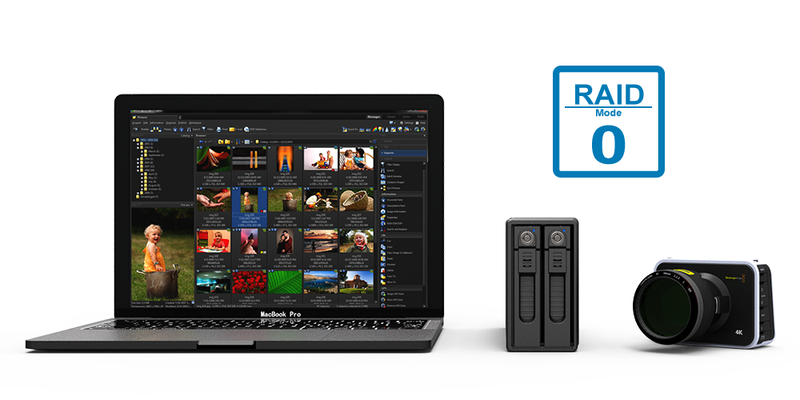 GR3660-TB3's RAID 0 mode lets you quickly browse large image libraries from external storage. So you have instant access to any photo in your library. Thunderbolt™ 3 Port x 2( up to 40 Gbps ), Support 15W (5V/3A) Power Delivering.